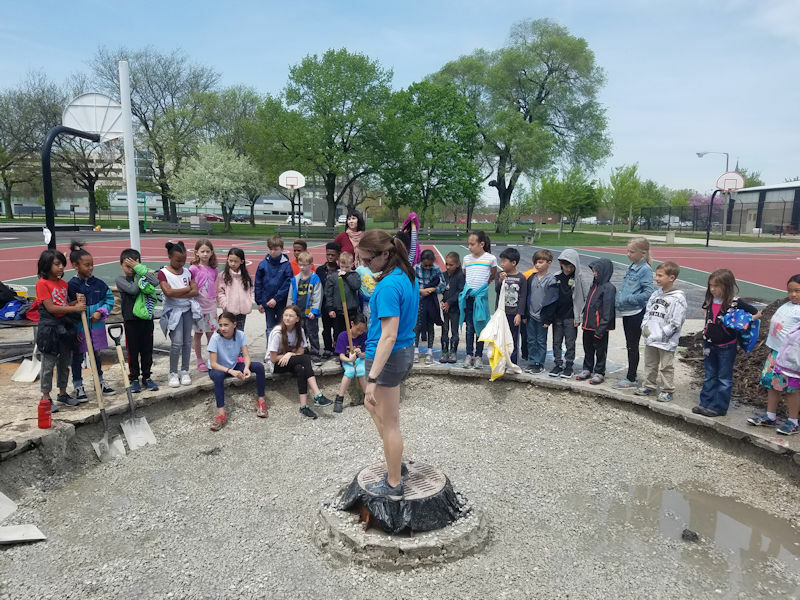 During the Central States Water Environment Association (CSWEA) first Service Project at the Skinner North Classical School (Chicago), volunteer Natalie Cook explains stormwater and green infrastructure to students. Photo courtesy of Katherine Magnuson. From making donations through social media to mastering athletic feats to raising money for a cause, working to make the world a better place has not gone out of style. Since 2008, Water Environment Federation (WEF; Alexandria, Va.) young professionals have decided that WEFTEC offers the perfect opportunity for WEF members to give back. Now, WEF Member Associations (MAs) are following the trend and hosting annual service projects. During WEFTEC 2008, about 60 volunteers from WEF, the local community, and other organizations constructed a rain garden at Pulaski Park (Chicago) for the WEF Service Project. Now a regular event, the project had grown to involve more than 220 volunteers in 2017 and to incorporate additional elements, such as the Water Palooza, a hands-on educational event hosted at the service project site. From left, Matthew Sokolowski, CSWEA volunteer, and Barbara McGowan, vice president of the Metropolitan Water Reclamation District of Greater Chicago, work with students and other volunteers to fill the rain garden with soil. Photo courtesy of Natalie Cook. 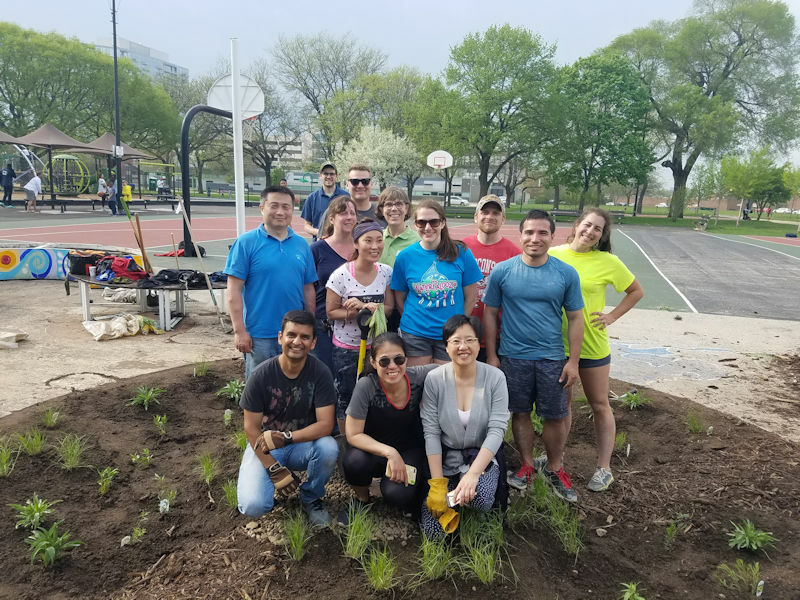 The volunteers who helped install a raingarden as part of the CSWEA Service Project included CSWEA volunteers, parents of Skinner North Classical School students, and a representative from The Spirted Gardener. Photo courtesy of Magnuson. 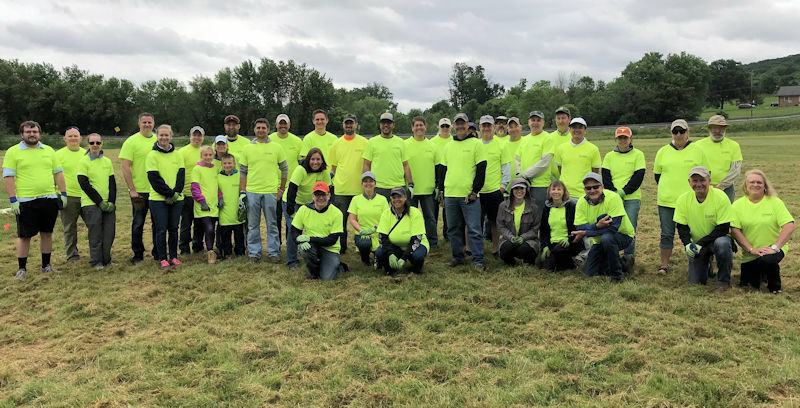 Natalie Cook, vice chair of the 2018 WEF Service Project, not only is helping coordinate the WEF event but also helped the Central States Water Environment Association (CSWEA) host its first annual service project. 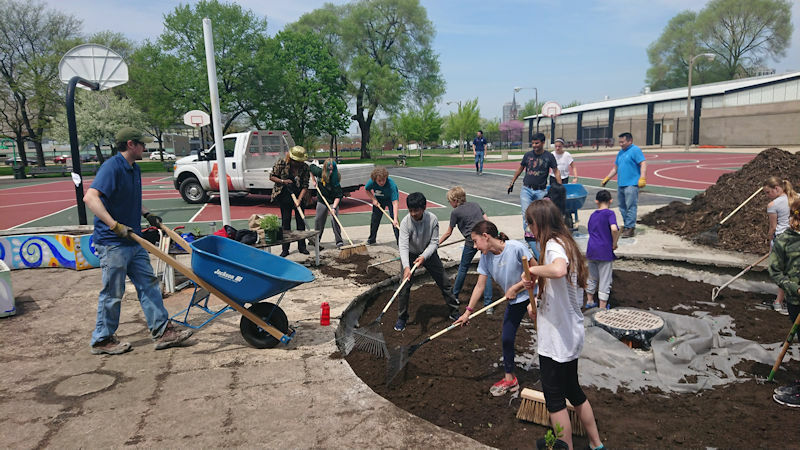 After learning about the bioswale built for the 2017 WEF Service Project, a group of fifth-grade students from Skinner North Classical School (Chicago) approached Cook with visions of installing green infrastructure at their school. The students, part of an all-girl team that competed at the FIRST® LEGO® League, had designed a system to solve flooding at their school’s playground. The competition challenges students to build a robotic system that solves a scientific problem. The students wanted to see if they could make the concept a reality, Cook said. “I was so impressed that these fifth-graders were … so dedicated and so passionate about it,” Cook said. “Goal number one [of the WEF Service Project] is to inspire students to learn about how they can contribute to the water environment.” And the students’ request aligned perfectly with this goal, she said. As a CSWEA member, Cook knew the MA had discussed hosting a service project during its annual conference. “I said, ‘today’s your lucky day, I found you a service project,” she said. 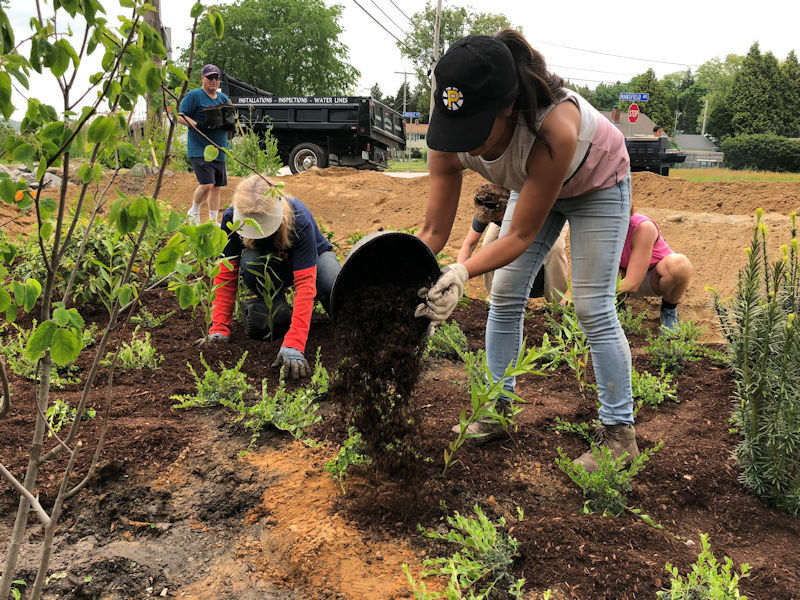 On May 14, volunteers gathered to build a rain garden that would capture stormwater that regularly flooded an area of the school’s playground. Volunteers laid gravel and soil and planted vegetation. Chris Marsinkie, chair of the 2018 WEF Service Project and fellow CSWEA member, showed up to help during the construction, Cook said. 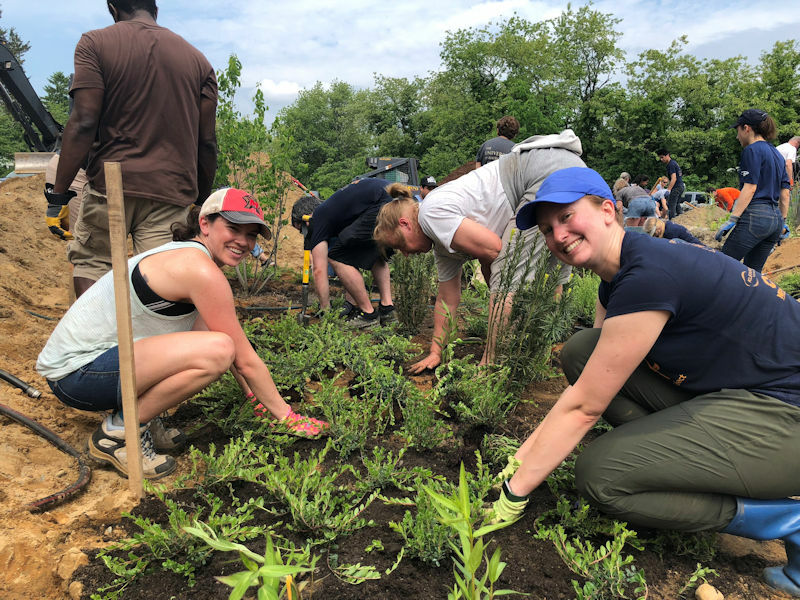 From left, Pennsylvania Water Environment Association (PWEA) member Jim Degnan and Water Environment Federation (Alexandria, Va.) President Jenny Hartfelder help plant trees for stormwater control as part of the organization’s first Service Project. Photo courtesy of Susan Boynton, PWEA executive director. Now, the students are looking into taking what they learned to other schools and helping others build their own rain gardens. “It feels great,” Cook said. About 45 volunteers helped plant between 275 and 300 trees during PWEA’s PennTec Community Service Project. Photo courtesy of Boynton. Two other MAs also hosted their first service projects this year. Students and Young Professionals Committees (SYPCs) for both the Pennsylvania Water Environment Association (PWEA) and the New England Water Environment Association (NEWEA) took the lead in organizing events for the MAs. 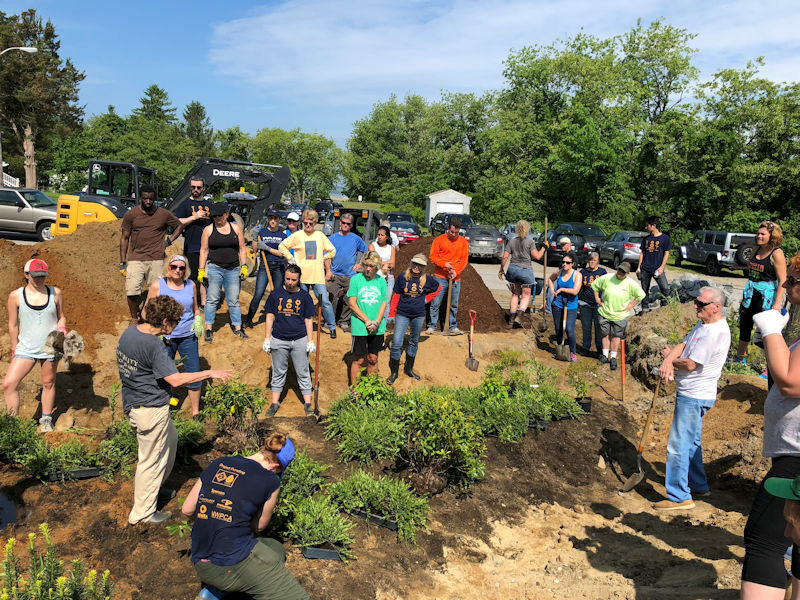 More than 45 volunteers gathered to construct a rain garden for the New England Water Environment Association (NEWEA) Service Project. Photo courtesy of Debbie Cheng, Kleinfelder (San Diego). On June 3, PWEA held the first PennTec Community Service Project. 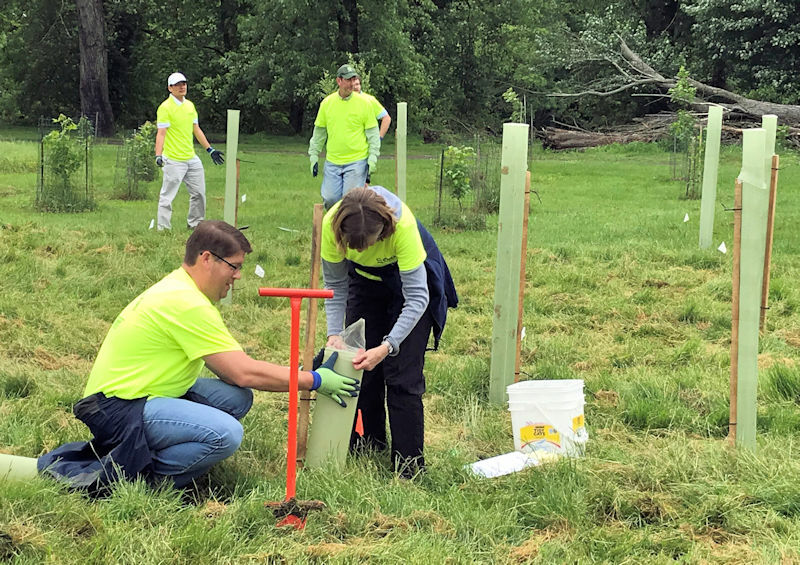 A total of 45 volunteers helped plant between 275 and 300 trees and install tubes, stakes, and bird nets to secure the trees as stormwater control in Hershey, Penn. The trees will help reduce stormwater runoff and remove pollutants before they can enter local waterways. “[PWEA] followed WEF’s lead on holding a service project during the time of the annual conference,” said Susan Boynton, PWEA executive director. She recommends that other MAs with enough potential volunteers and financial capabilities join in this tradition. The 71-m2 (760-ft2) rain garden has been designed to capture 50% of the runoff from the roof of the Common Fence Point Community Center in Portsmouth, R.I. Photo courtesy of Cheng. NEWEA members and the community came together to install green infrastructure as part of the project. Photo courtesy of Cheng.